1. Please unplug the electrode sleeve before use. 2. Press the switch ,place the electrode into the testsolution. 3. After the numerically stable ,press the HOLD button and take it out of the solution to read. 4. After reading,Switch off it and Clean the electrode,Cover it. 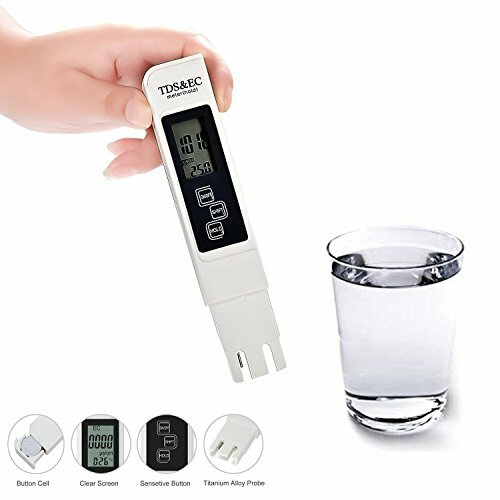 Professional quality combination TDS Meter, Electronic Conductivity Meter and Temperature Meter,Fast and accurate results.4 Display modes: TDS - ppm & °C, EC - µs/cm & °C, TDS - ppm & °F, EC - µs/cm & °F. TDS Tester tells you when you need to change your Filters. It Saves you Money and Protects Your Health!Ideal for home and laboratory testing applications, pool, aquarium, RO system, Spa,hydroponics etc. If you have any questions about this product by MUEQU, contact us by completing and submitting the form below. If you are looking for a specif part number, please include it with your message.